Today is a very special day...Pinkfresh Studio is celebrating its 5th Birthday!! We have so much in store for you for today's hop (spoiler alert: there are many prizes, heaps of inspiration, and fun shopping deals), but I also want to share my own little birthday salutation before we get going. I'm so grateful to have the opportunity to create with these beautiful products everyday and work with such an inspiring bunch of gals. It has been a really fun few months! Thank you Pinkfresh Studio for five years of creativity, inspiration, support and friendship. Thank you for arming us with beautiful things to create our art with. I wish you many more years of creative bliss! So without further ado, let's get hopping! 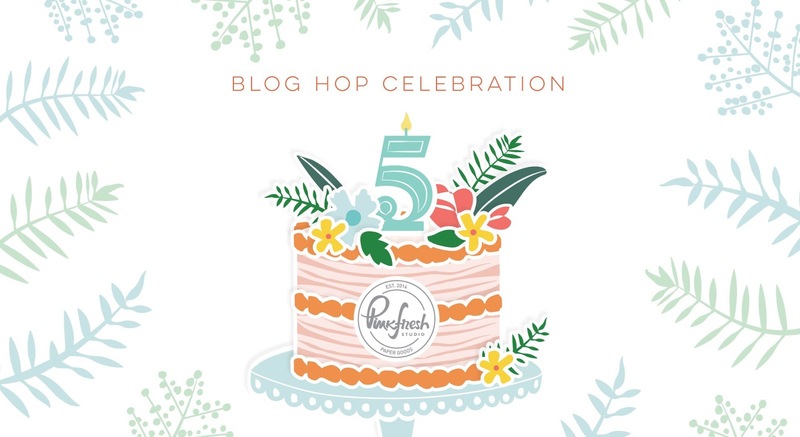 If you're joining along, you should have arrived here from the super, duper talented Nathalie's blog, but if you've lost your way or are just starting, you can see the full hop list here. For my project today, I decided to use an older set, Fleur 1 stamp set. It is still one of my favorite florals. Actually, I think it may be the most-reached-for floral in my stamp bunch! Seeing how much I love florals, and that it's a predominant theme in my stash, that is saying a lot :) You can see other cards I've created with this set here, here and here. Today, I decided to pair it with some vellum, gold embossing powder, and another favorite, versatile product, Wonder Stix. If you don't know about these incredible crayons, I've shared a three-part series which you can read here. But for now, let's chat more about these pretty petals. 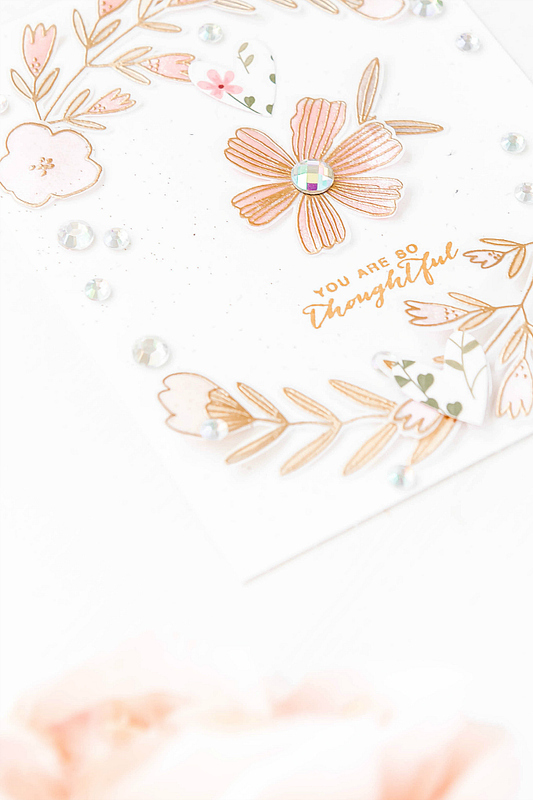 I added a dash of shimmer to my florals with the beautiful Nuvo shimmer pen, and some iridescent rhinestones all around the card. For my sentiment, I used a gold ink, and a phrase from the Heart and Soul stamp set. I added a couple of little hearts, and my simple card is all complete. Now before you head on to your next stop, we have LOTS of fun things in store! All orders will automatically receive this adorable die while supplies last. No code required. Also, from April 5th-7th, receive free shipping on US orders over $25. For our international friends, receive $5.50 off. Each blog stop on the hop is also giving away a $25 giftcard. Simply leave a comment below for a chance to win! And don't forget to comment on the Pinkfresh Blog for a chance at one of the grand prizes. The winners for all the prizes will be announced Sunday, April 14th on the Giveaway Page. Please be sure to check the page and claim your prize within 2 weeks. Thank you so much for joining us today. Now help us celebrate by heading along the hop and be sure to wish Happy Birthday to Pinkfresh Studio! Your next stop is the incredibly talented Amy Jo Vanden Brink. Your card is so pretty! I love the soft colors. The florals are so pretty. What a lovely design and colors Ivana. Such a beautiful and elegant card! I love the embossing and the soft color. Great job! Gorgeous! I love the delicate florals! Adorable creation...loved the softness...thanks for sharing!! So very elegant and beautiful. Love the coloring on vellum. Lovely soft flowers ... and sweet addition with the little hearts. So soft and lovely....... beautiful in every way!! As soon as your page opened up and I saw your card I said... Mmmmm; so pretty. The combo of gold and pastel pink is lovely. Thanks for the inspiration! So delicate and pretty. I love the peachy pink! LOVE the rose gold! Stunning! Oh - this is gorgeous! This is beautifully soft and elegant Ivana and I love the movement! Marvelous card! 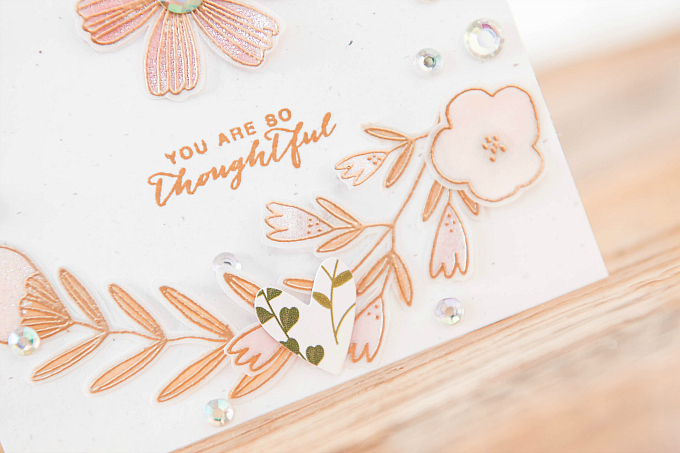 Beautiful embossing, elegant and sweet at the same time! 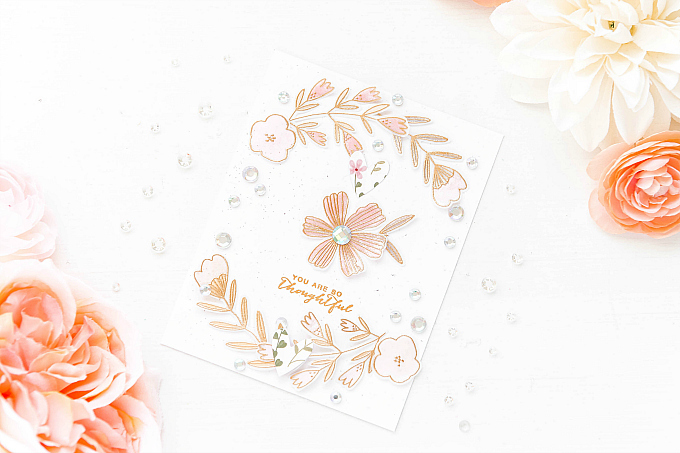 Elegant, soft colors and just a bit of bling... make for a very pretty card! This card speaks to me <3 it is so beautiful and the soft CAS design is just SO beautiful!!! Just stunning! Love the soft colors! 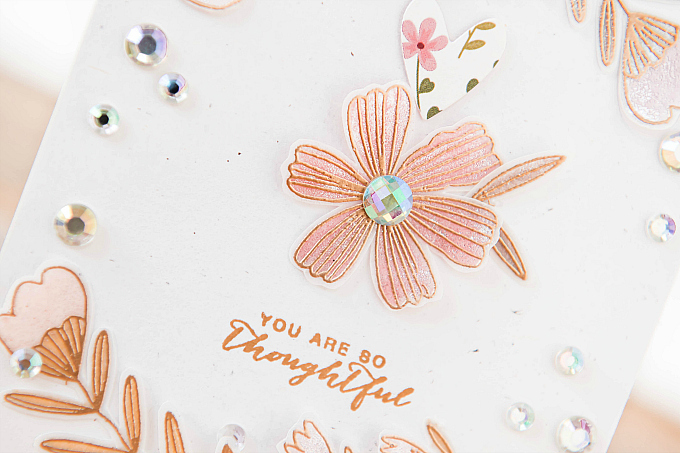 love that rose gold embossing powder and your card! Absolutely love this card. Thanks for the great inspiration! I love that stamp set too and your colors are gorgeous. So soft and dreamy. Your card is stunning! 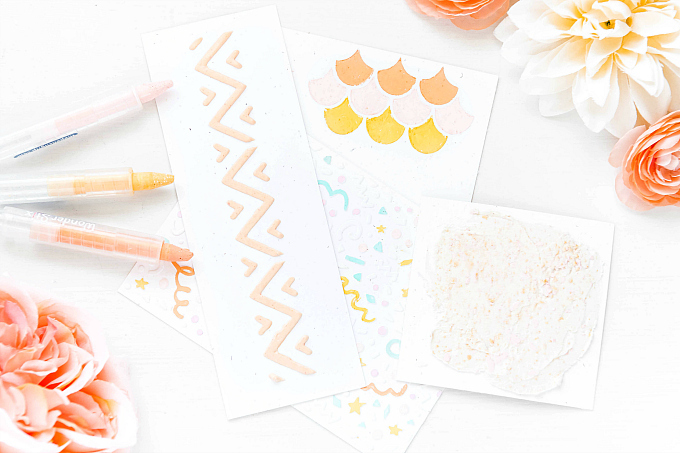 Love the soft colors and choice of embossing powder to compliment them! Stunning card! I love the soft colours you used and a little bling. Gorgeous card. Love the use of the vellum. 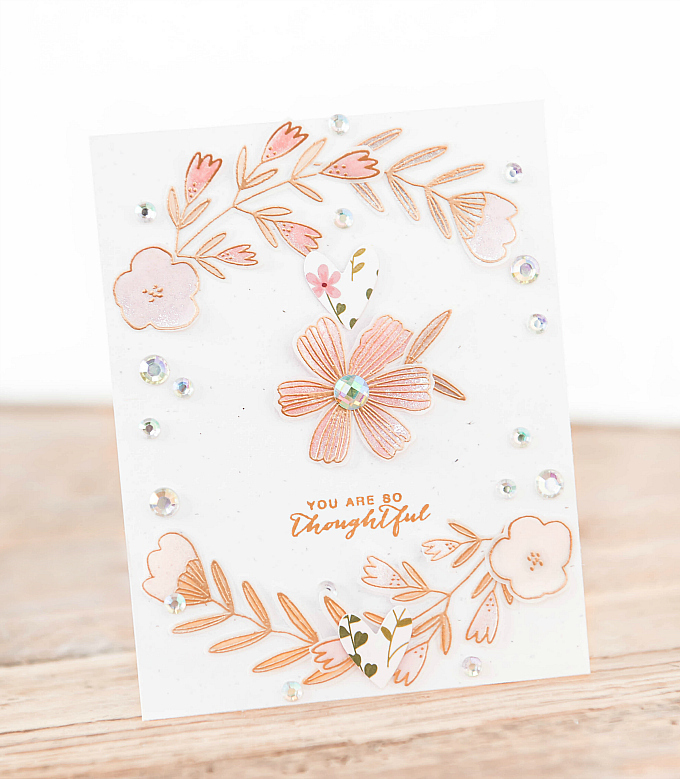 Love your beautiful floral card! So pretty with the soft colors! Just Gorgeous!! The gold embossing is stunning and is perfect with the vellum. What a beautifully elegant card! Thanks for the inspiration! Oh my, this is so pretty and delicate. I love the colors and the sparkle. Oh my gosh!! I love that card! Your style is so refreshing, Ivana--with or without lots of layers! 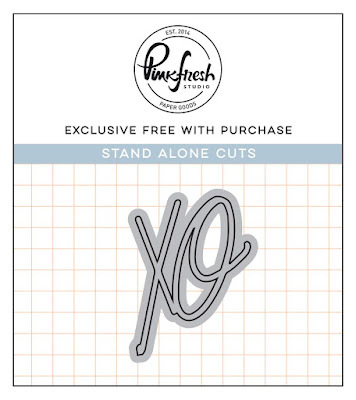 I almost got this stamp set because of seeing you use it in the past & I love everything about this new card! It will definitely be in my order if I'm a lucky gc winner! Such a lovely card! Thank you for sharing! I am obsessed with your card! So beautiful! 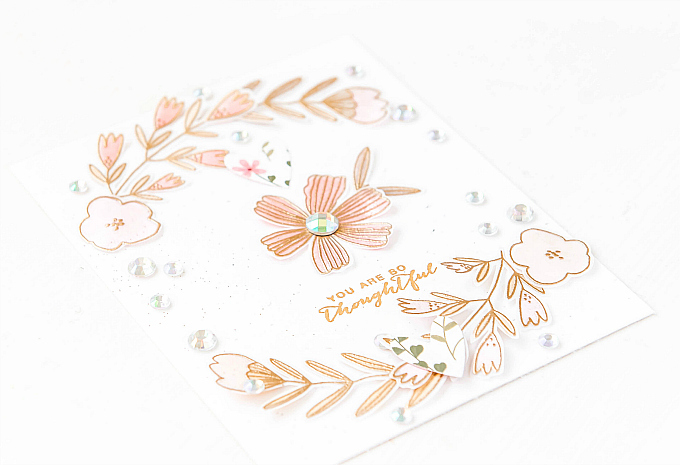 I love the dainty florals in Fleur 1 and your lovely card design! Your card is very beuatiful!! Beautiful, Ivana! Another gorgeous make of yours, the colours look amazing! yOUR CARD IS GORGEOUS! I'VE SEEN SOME REALLY NICE CARDS WITH THE FLEUR 1 SET. THE LINES ARE SO DELICATE AND YOUR COLOR PALETTE REALLY ENHANCES THAT DELICATE LOOK. Awesome card! I’ll have to look into the Wonder Stix, they work so well with your design! Such a beautiful and delicate card! Lovely design! Gorgeous - what a color combo, so classy! Fabulous card! Love the soft colors and your wonderful style. Oh such a pretty card, love this! pretty pretty pretty florals!!! and who can resist a sparkly!! Those sweet kisses of pattern paper hearts are the perfect touch Ivana! I absolutely love this card! The colors are fabulous and the bling is perfect. My favorite card so far on this hop! So pretty with the embossing. Love the details on your card. Very sweet. Beautiful job. Thanks for sharing your creativity! Very pretty card,Thanks for sharing. Elegant yet peaceful, Ivana! Have to check out those Wonder Stix. I love this beautiful peach color. So gorgeous!!! Oooh this is so pretty! The gold embossing powder against the Wonderstix pink colored vellum makes the EP appear rose-gold. SO gorgeous! And I went and read your intro to Wonderstix - I am so hooked! Thanks for a well written article, you answered every question I had! Oh my what Elegant cards! Simply beautiful! 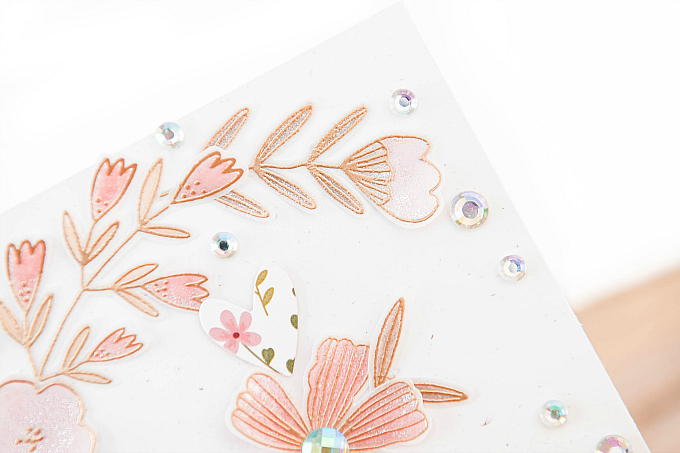 Wow, the peachy-pink color of the flowers with the gold embossing powder is beautiful! I like the softness of the vellum with this stamp set. Lovely card! Love the embossing, such a lovely choice of colors, great card. That's gold embossing powder? Wow, it's amazing how coloring brings out the different tones of powders. I would have sworn that was a rose gold. But what a fabulous, soft card. It feels very much like an enchanted garden to me. Thanks for sharing! Love the pretty petals with the gold embossing. It makes them really stand out. Such a pretty card. Beautiful card! Love the combo of gold embossing and soft colouring on vellum. Looks very elegant. 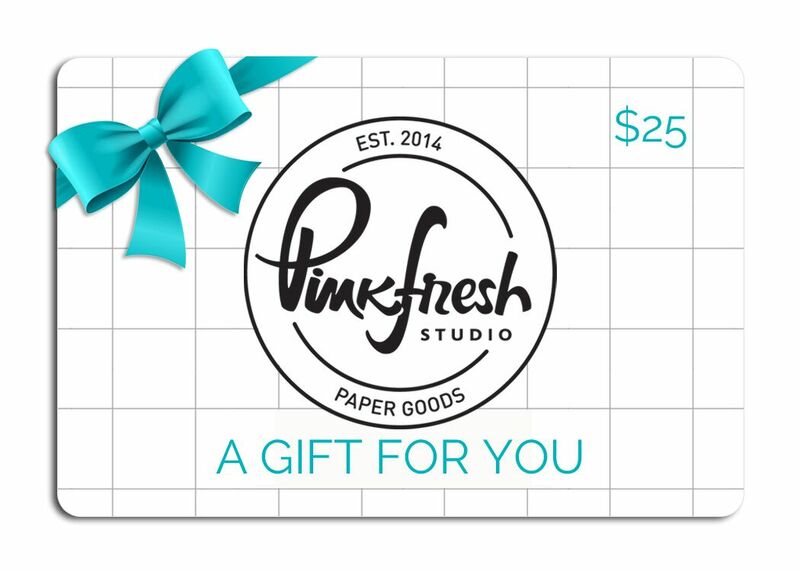 Congrats to Pinkfresh Studio on completing 5 years. I love your products. Wishing you many more successful years ahead. Love your beautiful, elegant card. Very beautiful. Love the soft colours. Such a beautiful card! 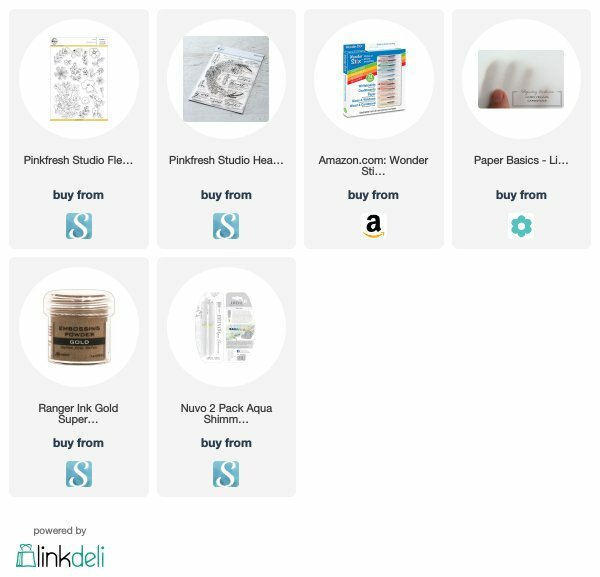 I just added Wonder Stix to my Amazon cart :) am very excited to try them out! So delicate and sweet!! Beautiful work. Stunning card! Such an elegant design and color palette. Your work is all so elegant. I definitely got sidetracked peeking at your other projects! So beautiful! Love the rhinestones on here too! I need to stop ignoring my vellum and only using embossing powders for sentiments! ;) so pretty!